If the endless circuit of repetitive simulations and duplications continues then we should at least attempt to find some ecstasy, some liberty and some echoes of what we have lost within it. Jean-Daniel Pollet’s essay film is an edifice (strong yet weak, monumental but crumbling, still just together but ready to split into fragments light enough to be carried away by the wind) that reminds us of time and a true imagination that reaches deep into the currents of history and is unencumbered by its falsified reconstructions, and which pricks at our amnesia and the facile nature of the signs usually given to us to represent a shared past. Pollet gives us images and little scenes and, together with Philippe Sollers and Antoine Duhamel, he asks us to find together what breathes in them and between them, what colours the edges of the frame so strongly and lurks at their heart so prominently that the prosaic is transformed into the infinitely, inexplicably profound. To help us find these traces the images are returned to us over and over again in new configurations that poke us (rather than leading us by the hand) towards some unknown or forgotten end point, an animal that we can hear purring but can’t put a definitive name to, that we can’t even really see in full for all the shadow and distraction in the room. A statue of an ancient God is turned towards, his arms outstretched and his eyes fixed on us, and the gesture of offering is clear. There is no promise, I suppose, but there is an invitation to something (some real, tangible but intangible thing) and that perhaps, nowadays, is enough. This might be the best film ever made. It is certainly one of the most beautiful. And more than anything it reminds us of the potentialities of the cinema, a kind of film-making so far removed from the traditional norm that if were to have gained any sort of prominence at all in the mainstream then our current year would most likely look entirely different. One can hope still. Désiré is slick, neat, classically-composed with a few nice moments and carrying a feeling that the boulevard theatre was capable of throttling the life out of cinema, of slipping a noose around its neck. Here we can see how television was the true home for recorded theatre for already, in 1937, there is evidence of the television aesthetics of twenty and thirty years later: characters stand still and spout endless streams of dialogue at each other, usually in shot-reverse-shot close-up and mid-shot patterns, and the only time the question of wider cinematic space and geometry is considered is in a rather striking and singular overhead shot of a dinner party. Guitry’s final monologue is very nice, the way the film decides to forego the following of farcical affair full of the potential for comic affect in favour of a defiant gesture against the repetition of self-destructive behaviour surprising and affecting, but it also pulls off the neat trick of making sure the class system and those within it stay rigidly in place and divided. Andrew Sarris, amongst others, has called Guitry “worldly”; I suppose this is true if one considers worldliness to be a sort of traditional bourgeois cynicism and ‘frankness’ and the limits of the world being the full stop at the end of an expertly-penned witticism. I’d prefer to consider Pollet, for all his rooting in the dark, worldly. Compared to the verve and invention of Story of a Thief, Guitry’s film of the previous year, this is very disappointing and tiresome stuff, a skeletal farce with its bones long ago picked mostly bare. A B-grade film from the Val Lewton stable, but a b-grade Lewton is still an A-grade picture by the standards of almost any other film-maker. Boris Karloff always seems far more English than Greek, but there’s no disputing or escaping the power of his wild-eyed gaze, a gaze that seems to be able to look back through the present towards an ancient past and a long history of bloodshed, disease, death and decay. 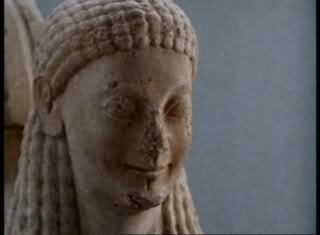 None of the other characters are especially memorable, which is the biggest problem in a film so surprisingly wordy, apart from Helene Thimig (wife of Max Reinhardt) as Madame Kyra, a woman who feels adrift in time and equally capable of belonging to Ancient Greece, the 15th century or the early 20th century setting of the film. Well, sometimes, what can one say? Mizoguchi works have a knack of existing beyond words; this perhaps is the final definition of what we mean by ‘cinematic’. Let’s just say that Osaka Elegy is perfectly composed, measured, distilled and delivered, and that is poised like a cat ready to strike. What’s remarkable in retrospect is how many different styles and movements in film-making are drawn upon here and melded nearly seamlessly: there is the silent film’s emphasis on image, the avant-garde’s (in the sense of Jean Epstein’s) dedication to tone and form that allows for both a full impression of the world, and the slow revelation of a character’s feelings about their established place in the cosmic order without having to rely on the over-familiar motions of psychological-realist story-telling, the camera-angles, lighting and deep-focus of the Expressionists and a great deal of the lyrical cinema of Renoir or Ophuls with its poetic digression and elaborate camera movements that are also used to explain, demonstrate and discover. 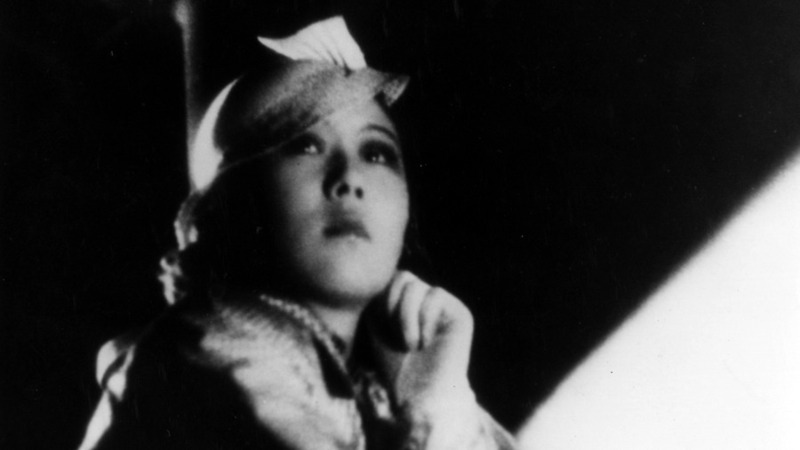 As in the contemporaneous work of Ozu and Naruse there is a focus on the (suffocating) dynamics of family-living, the exploitation of women by weak and selfish men, the clash between conservative tradition and modernity, the way one’s soul hardens or is corrupted under the weight of social expectation or injustice and the struggle to hold on to one’s dignity and goodness. What is striking is the way camera tracks and captures these character’s lives, their compromises, their humiliations, but also hangs back, keeps a distance, respectful and sincere, wanting simply to show us but not to intrude, seemingly not wanting to force itself upon already vulnerable characters or speak or feel for them; we are asked to find the feeling and understanding for ourselves. 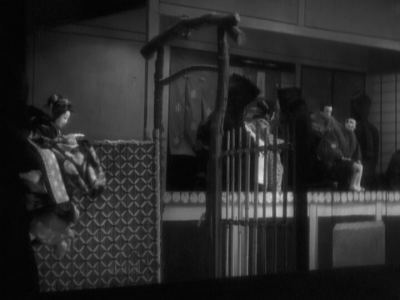 As a result the film sometimes feels like it has a placid surface until the moments when the tracking of a camera reminds us of the great, powerful shifting currents lying beneath everything (why is it with Mizoguchi we are so often reduced to water-based metaphors?). One could call the film definitive in its own way except that Mizoguchi would spin variations on this theme, these characters, throughout his career, populating a whole sullen universe with men and women and stories like these. No matter; it feels definitive while it plays out, and the final shot of the excellent Isuzu Yamada walking towards the camera with her accusing and defiant gaze fixed upon it calls ahead to the Neo-Realists, Summer with Monika, Godard, Demy… The gaze turned back on the audience; could one say that this is the definitive image (in all of its incarnations) of twentieth century cinema? Like Mediterranee and Isle of the Dead this is a film that quivers in front of questions of faith; questions of faith in humanity, progress, the passage of time, tradition, social systems, the revenge of the past and the simultaneous great weight and evaporation of the present. See them all together for a wild triple-bill.